GeoSkrim® RB20BBV incorporates high-strength reinforcement with the latest in barrier technology designed to provide an effective barrier to odor and gases. RB20BBV is manufactured with an outer ply consisting of seven-layers including an integrated core of a high performance polymer with enhanced barrier properties. This limits migration of volatile organic compounds including methane, halogenated hydrocarbons, aromatic hydrocarbons and odors. The barrier layer is more effective than standard polyethylene in gas and odor control, while providing the same great strength and toughness expected from patented GeoSkrim® fiberreinforced membranes. 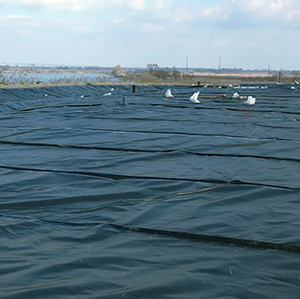 Diagonal scrim reinforcement is placed between these plies to provide optimal tear resistance and increased service life. Click here for Product Data Sheet.